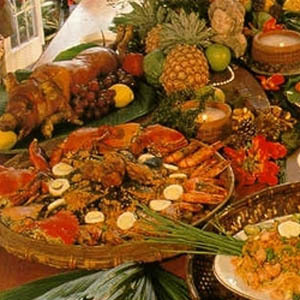 During the pre-Hispanic era in the Philippines, the preferred Austronesian methods for food preparation were boiling, steaming and roasting. The ingredients for common dishes were obtained from locally raised livestock. These ranged from kalabaw (water buffaloes), baka (cows), manok (chickens) and baboy (pigs) to various kinds of fish and seafood. In 3200 BCE, Austronesians from the southern China Yunnan-Guizhou Plateau and Taiwan settled in the region that is now called the Philippines. They brought with them knowledge of rice cultivation and other farming practices which increased the number and variety of edible dish ingredients available for cooking. Direct trade and cultural exchange with Hokkien China in the Philippines in the Song dynasty (960–1279 BC) with porcelain, ceramics, and silk being traded for spices and trepang in Luzon. This early cultural contact with China introduced a number of staple food into Philippine cuisine, most notably toyo (soy sauce; Chinese: 豆油; Pe̍h-ōe-jī: tāu-yu), tokwa; (tofu; Chinese: 豆干; Pe̍h-ōe-jī: tāu-koaⁿ), toge (bean sprout; Chinese: 豆芽; Pe̍h-ōe-jī: tāu-koaⁿ), and patis (fish sauce), as well as the method of stir frying and making savory soup bases.